After a long hiatus, I have regained some control over my knitting machine. Fortunately, I had kept it in a good location and it only needed a good cleaning. Not even a deep cleaning, which would have required disassembling the beast. Now it is performing well--at least as well as my skills can oversee. I acquired my machine during my time in London when I was doing my City and Guilds course. But once back in the States, I knit with it very little. Now, with a number of knit 'works-in-progress,' I am faced with the same dilemma as long ago. That is, lots of ideas and not enough time to execute even a fraction of them. I continue to be surprised at the attitude of most knitters to machine knitting, who, by and large, look down upon any automation. For heaven's sake, the items don't knit themselves! 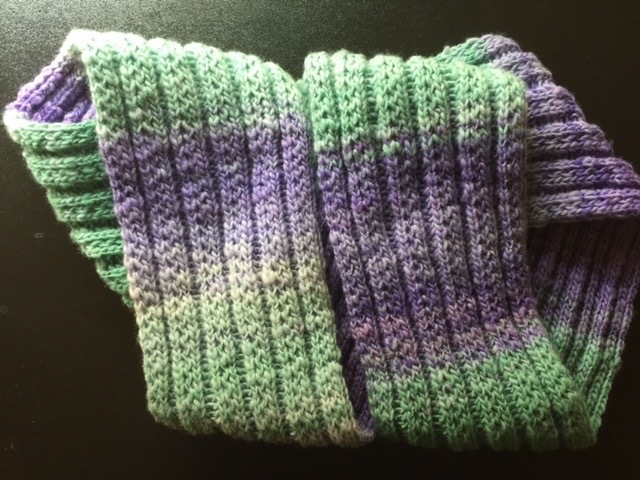 Each project requires the same amount of planning and attention to detail as a handknit. Only the process may be faster. I say 'may' because there can be a great deal of time-sucking manipulation of stitches and manual work involved. 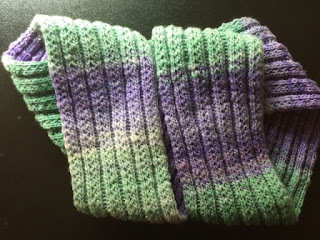 I started at the beginning on the knitting machine, relearning to cast on stitches. 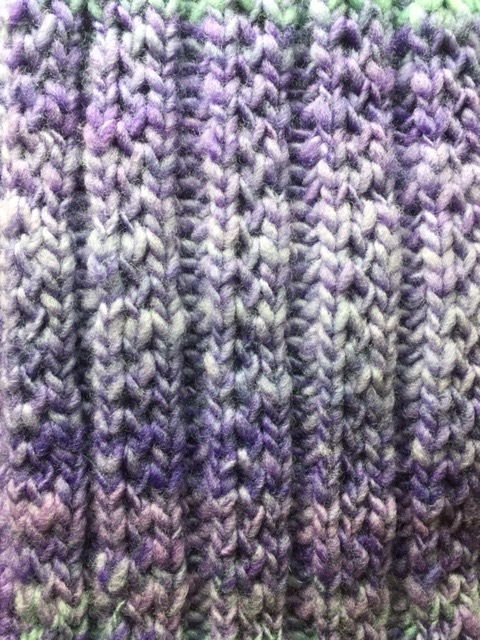 Then I knit samples. I knit lots of samples. I have two near-term objectives. One is to knit sleeves for coat-weight handwoven fabric. I don't have enough yarn for the sleeves, so I'm now planning colorways and suitable knit fabrics that will complement, but not compete with, the coat. The other project is a jacket that I saw at Vogue Knitting Live in New York earlier this year. Designed and worn by speaker Laura Bryant, I particularly liked the pattern drape and design. It's on the cover--and in--her book, Artful Color Mindful Knits, so promptly ordered on my return home. The key, she told the group, was the shaped arms and the collar. The body pieces are just rectangles--perfect for the machine. But before I embark on such a project, I need to know if I'll like the jacket design because it has dropped sleeves--and I generally HATE dropped-sleeve designs.) So today, I plan to do gauge samples, decide what stitch pattern I'll use and knit up the pieces. Only then will I know if I like it or not. 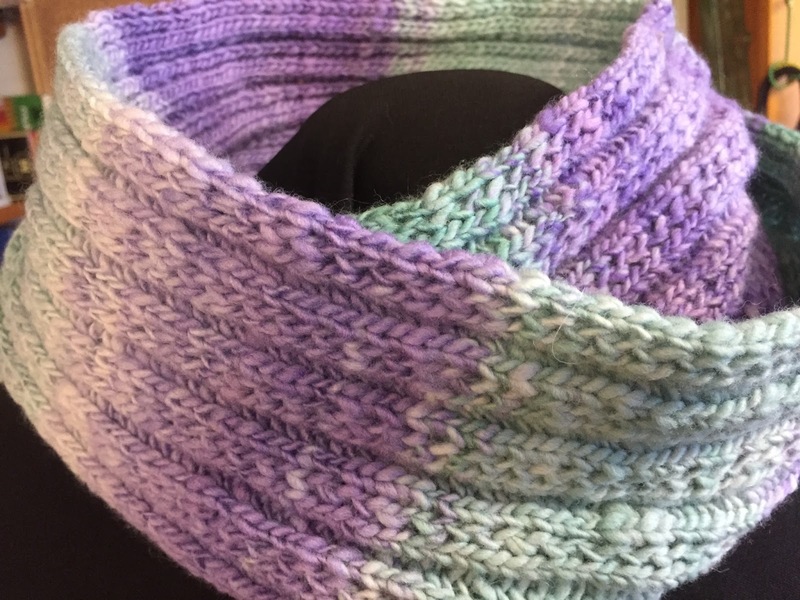 Last week, I shared with you my journey spinning for knitting. And although I shared a photo of my first project off the machine, I didn't give a lot of detail. It was based on a stitch sample I had knit and some handspun Merino singles. I had 3.9 oz. of yarn, 16 wpi. It was my first foray spinning Merino and it wasn't as evenly spun as I'd have liked, but as you can see in the detail at right, it doesn't stand out, thanks to the textured rib pattern. Pinelands Spring cowl was the project and, because I like it....a lot...I wrote out the pattern and posted it on Ravelry as a free download. It's perfect for handspun--even less-than-perfectly-spun handspun. 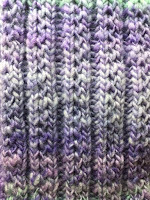 And if you don't have a machine, but like the textured rib, maybe you can play around with a handknit rib that achieves an equally interesting texture. Time to play!